Protein homology is the a way to compare the evolutionary relationships between varying proteins based on the degree of similarity in sequence. Two proteins can share homology due to a speciation event (orthologs) or a duplication event (paralogs). Determining homolgous relationships is useful for investigating protein functions. The human protein of interest can be studied in other species or model organisms that share a strong protein homology. Analysis of protein homologs and alignment indicates the protein is extremely well conserved among mammals. In fact, the cytoplasmic domain is 100% conserved among mammals. There must be strong selective pressure to maintain the sequence and structure of the cytoplasmic domain, suggesting its role is important to overall protein function. The strongest homology was observed in primates, which is expected as they more closely related to homo sapiens. Decreasing homology was observed as the species became more evolutionarily distant. There were no homologs identified in model organisms (arabidopsis, brassica rapa, C. elegans, Drosphilia) as these organisms do not have immune systems. The homolog in trout is likely to be homologous to a zebra fish protein. Further exploration is needed to determine if a zebra fish, with its more primitive immune system, would serve as a good model organism. Based on the homology above, the mouse is the clear choice as a model organism. 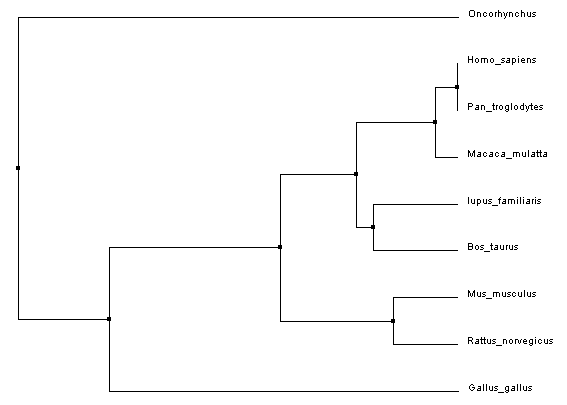 All phylogenetic trees are very similar, regardless of the method used. Even different alignment methods such as T-coffee and MUSCLE produced similar trees (these trees are not shown). The consistent phylogenetic relationships demonstrate the conservation of the CTLA4 protein, where changes to the protein likely correspond to speciation events. The trees are in agreement with known phylogenetic relationships and with protein homology results. The macaque and chimpanzee shared the greatest sequence homolgy and are closest on the phylogenetic tree. In fact, the grouping of species into clades corresponds to homology. The rat and mouse had 76% and 75% homology to CTLA4 respectively and these are grouped into a clade; a similar result is observed with cattle and dog. The chicken is not a mammal and the trout is even more phylogenticaly distant, so it is logical the CTLA4 protein has a greater evolutionary distance. Delsuc F., Brinkmann H., Philippe H. (2005). Phylogenomics and the Reconstruction of the Tree of Life. Nature Reviews Genetics 6, 361-375. doi:10.1038/nrg1603.